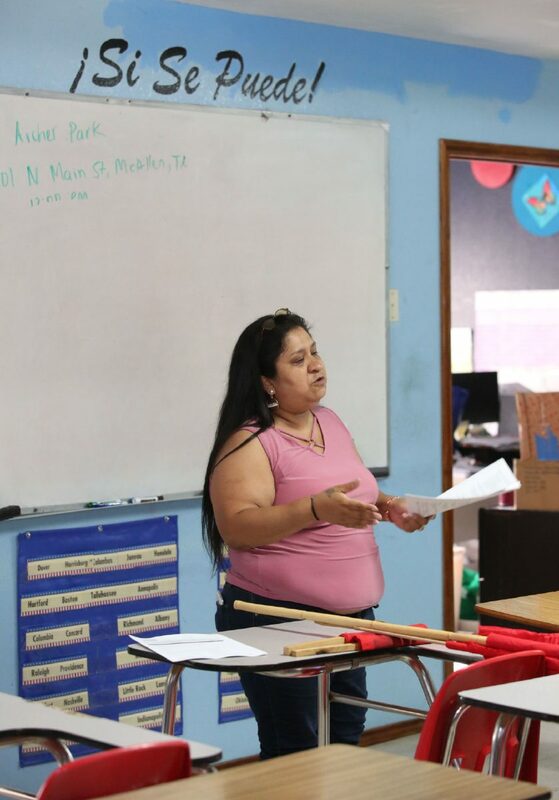 Adult Education coordinator, and teacher Elizabeth Rodriguez Marquez teaches her class the history of the United States at LUPE on Wednesday, June 27, 2018 in Alamo. SAN JUAN — A teacher stood at the front of a classroom, asking questions about the foundations of the United States. Her students responded like any other class: some stayed quiet, some raised their hands, some said the answer immediately. But the students were not any other class — they were adults preparing for the citizenship exam. Local locations of LUPE, La Union del Pueblo Entero, host regular citizenship and English classes for its members. Marquez said the average age of her students is 60 years old. 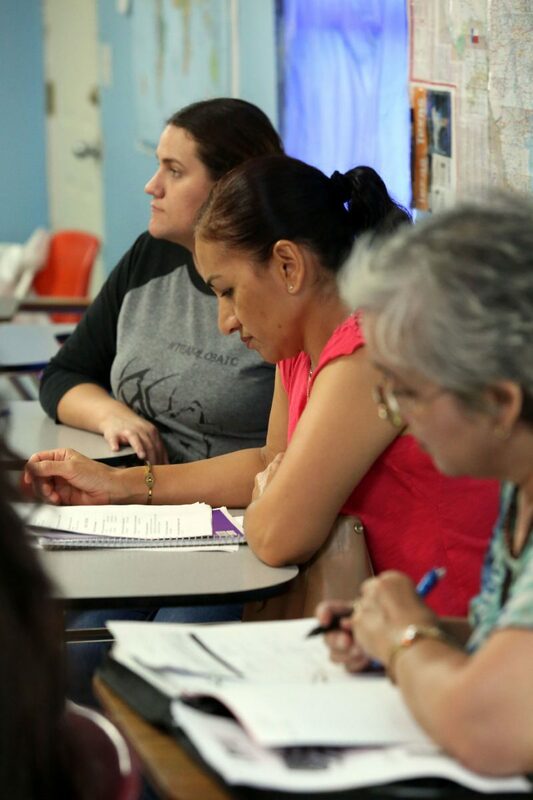 Students in the Adult Education English classes prepare to answer history questions about the United States during a class at LUPE on Wednesday, June 27, 2018 in Alamo. 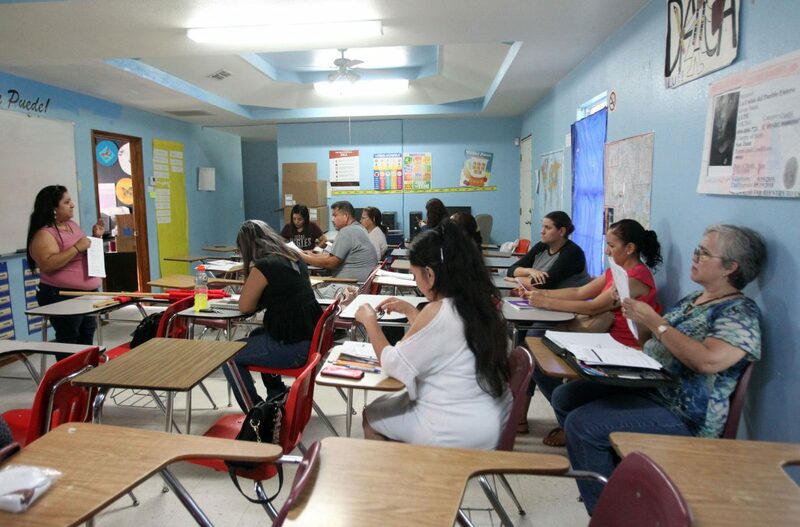 Elizabeth Rodriguez Marquez teaches an Adult Education English classes at LUPE on Wednesday, June 27, 2018 in Alamo. Rodriguez Marquez says she has seen a huge increase in people wanting to take english classes and become US citizens. In the midst of a national immigration crisis taking place in the Valley, members of LUPE taking these classes are working to make a change they feel is necessary for their livelihood. Marquez said the application process for residents to become citizens typically takes two to three months, six maximum. But since Trump’s election, there has been such an increase in local residents registering that the process is taking up to a year and a half. While the students were enthusiastic in class, it was clear how heavily the political controversy surrounding immigration motivated them to become citizens. One student in the class, Yolanda Shriver of Pharr, said safety and opportunity are part of why she wants to become a citizen. Another student, Donna resident Maria Medrano, used to live in Reynosa and would visit the area with her family. Now her kids are grown and encouraged her to take the exam. “Citizens here are more of a priority,” Medrano said in Spanish. Like Shriver, Medrano wants to know the country will see her as equal to people born here. LUPE communication coordinator John-Michael Torres echoed Marquez’s statements about the immigration crisis worrying people who have not committed any crimes. The zero-tolerance policy, Torres said, also impacts people crossing the border to be with family that is already here. While the group has been able to reunite or at least locate some family members, Torres said some current immigration policies need to be abandoned. The backlash against children being held in cages forced Trump and many Republicans to speak against family separations, and Torres hopes that outrage will continue and help end zero-tolerance entirely. Marquez agrees, and she makes a point of reminding her students.